NASA’s Galileo spacecraft was intentionally crashed into Jupiter on Sunday, ending 14 years of service to science and exploration. The spacecraft entered Jupiter’s thick atmosphere and disintegrated at 1857 GMT (2:57pm EDT), but the last signals arrived at Earth nearly an hour later because of the great distance to Jupiter. At the end of its mission, Galileo lacked the fuel to escape the Jovian system so scientists decided to crash it into Jupiter to avoid contaminating any potential life on Europa, which is believed to have liquid water oceans under a thick sheet of ice. The Galileo spacecraft’s 14-year odyssey came to an end on Sunday, Sept. 21, when the spacecraft passed into Jupiter’s shadow then disintegrated in the planet’s dense atmosphere at 11:57 a.m. Pacific Daylight Time. The Deep Space Network tracking station in Goldstone, Calif., received the last signal at 12:43:14 PDT. The delay is due to the time it takes for the signal to travel to Earth. Hundreds of former Galileo project members and their families were present at NASA’s Jet Propulsion Laboratory in Pasadena, Calif., for a celebration to bid the spacecraft goodbye. “We learned mind-boggling things. This mission was worth its weight in gold,” said Dr. Claudia Alexander, Galileo project manager. Having traveled approximately 4.6 billion kilometers (about 2.8 billion miles), the hardy spacecraft endured more than four times the cumulative dose of harmful jovian radiation it was designed to withstand. During a previous flyby of the moon Amalthea in November 2002, flashes of light were seen by the star scanner that indicated the presence of rocky debris circling Jupiter in the vicinity of the small moon. Another measurement of this area was taken today during Galileo’s final pass. Further analysis may help confirm or constrain the existence of a ring at Amalthea’s orbit. “We haven’t lost a spacecraft, we’ve gained a steppingstone into the future of space exploration,” said Dr. Torrance Johnson, Galileo project scientist. The spacecraft was purposely put on a collision course with Jupiter because the onboard propellant was nearly depleted and to eliminate any chance of an unwanted impact between the spacecraft and Jupiter’s moon Europa, which Galileo discovered is likely to have a subsurface ocean. Without propellant, the spacecraft would not be able to point its antenna toward Earth or adjust its trajectory, so controlling the spacecraft would no longer be possible. The possibility of life existing on Europa is so compelling and has raised so many unanswered questions that it is prompting plans for future spacecraft to return to the icy moon. Galileo was launched from the cargo bay of Space Shuttle Atlantis in 1989. The exciting list of discoveries started even before Galileo got a glimpse of Jupiter. As it crossed the asteroid belt in October 1991, Galileo snapped images of Gaspra, returning the first ever close-up image of an asteroid. Less then a year later, the spacecraft got up close to yet another asteroid, Ida, revealing it had its own little “moon,” Dactyl, the first known moon of an asteroid. In 1994 the spacecraft made the only direct observation of a comet impacting a planet– comet Shoemaker-Levy 9’s collision with Jupiter. The descent probe made the first in-place studies of the planet’s clouds and winds, and it furthered scientists’ understanding of how Jupiter evolved. The probe also made composition measurements designed to assess the degree of evolution of Jupiter compared to the Sun. Galileo made the first observation of ammonia clouds in another planet’s atmosphere. It also observed numerous large thunderstorms on Jupiter many times larger than those on Earth, with lightning strikes up to 1,000 times more powerful than on Earth. It was the first spacecraft to dwell in a giant planet’s magnetosphere long enough to identify its global structure and to investigate the dynamics of Jupiter’s magnetic field. Galileo determined that Jupiter’s ring system is formed by dust kicked up as interplanetary meteoroids smash into the planet’s four small inner moons. Galileo data showed that Jupiter’s outermost ring is actually two rings, one embedded within the other. Galileo extensively investigated the geologic diversity of Jupiter’s four largest moons: Ganymede, Callisto, Io and Europa. Galileo found that Io’s extensive volcanic activity is 100 times greater than that found on Earth. The moon Europa, Galileo unveiled, could be hiding a salty ocean up to 100 kilometers (62 miles) deep underneath its frozen surface containing about twice as much water as all the Earth’s oceans. Data also showed Ganymede and Callisto may have a liquid-saltwater layer. The biggest discovery surrounding Ganymede was the presence of a magnetic field. No other moon of any planet is known to have one. 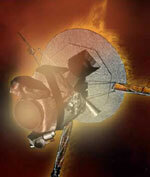 The prime mission ended six years ago, after two years of orbiting Jupiter. NASA extended the mission three times to continue taking advantage of Galileo’s unique capabilities for accomplishing valuable science. The mission was possible because it drew its power from two long-lasting radioisotope thermoelectric generators provided by the Department of Energy. “The mission was a testimonial to the persistence of NASA even through tremendous challenges. It was a phenomenal mission,” said Sean O’Keefe, NASA administrator.